Through 1944 to 1945, Tokyo was bombed more than 100 times. Especially, the bombing on March 10, 1945 was the most devastating. Incendiary bombs burned the whole city to the ground. Fukagawa, Ozu’s birthplace has been bombed most heavily and destroyed completely. After the war, shabby looking shacks gave immediate shelters to those who survived the bombing or came back from the war zones. These shacks became the symbols of Tokyo rebuilding. Supreme Commander of Allied Forces, the Occupation Forces in Japan, reassigned the buildings and streets to meet their efficiency. On the other hand, they were quite indifferent toward the rebuilding of Japanese cities, especially Tokyo. Hideaki Ishikawa, the Head of Urban Planning Office of Tokyo, proposed a quite ambitious plan for Tokyo rebuilding. His proposals included several 100-m wide main streets intersecting metropolitan areas, large areas of parks and greens and rearrangement of residential areas and commercial areas. But this proposal was ignored by SCAP and Seiichiro Yasui, the Mayor of Tokyo at the time. SCAP contemptuously called it “the plan of the victor”, and Yasui was determined to discard the plan. The plan demanded the immense budget and Yasui said “What Tokyo needs now is not the grandiose plan but the place for people to live”. His assessment was probably right at the time, considering the fact that the whole city was covered with shacks made of scraps and debris by 1947. Furthermore, in 1949, SCAP demanded tight budget control (Dodge Line), which resulted in further shift-down in implementation of the plan. Because of economic turmoil and material and food shortage, there were thousands of black markets all over the city. City Office was determined to shut down these black markets. Another problem was enormous amounts of debris of concrete and other materials from bombing. They dumped debris and junk into the rivers and moats running through Tokyo to provide more land for city development. As a result, Tokyo was no longer the city of water it used to be. Urban planning of Tokyo after the war miserably failed. When Shukichi Hirayama (Chishu Ryu) and Tomi Hirayama (Chieko Higashiyama), the aging father and mother, found themselves homeless in the middle of Tokyo, they looked out from the bridge, gazed the vast scenery of Tokyo, and were overwhelmed by the myriad of the metropolis. But we, the viewers, never have a chance to see what Hirayamas saw. It is well known that this bridge was in Ueno and Hirayamas were looking down on Ueno Railway Station. In another scene, Noriko shows Hirayamas the panoramas of Tokyo from the staircase of the tall building (Matsuya Deparment Store in Ginza). And again, we are not allowed to share the view Hirayamas and Noriko saw. And there was a short insert of the view of Tokyo, acting as a bridge to the next scene. Yoshishige Yoshida called it “Absence of Tokyo”. Tokyo is not as visible, or hidden from our eyes. But it is not completely hidden. 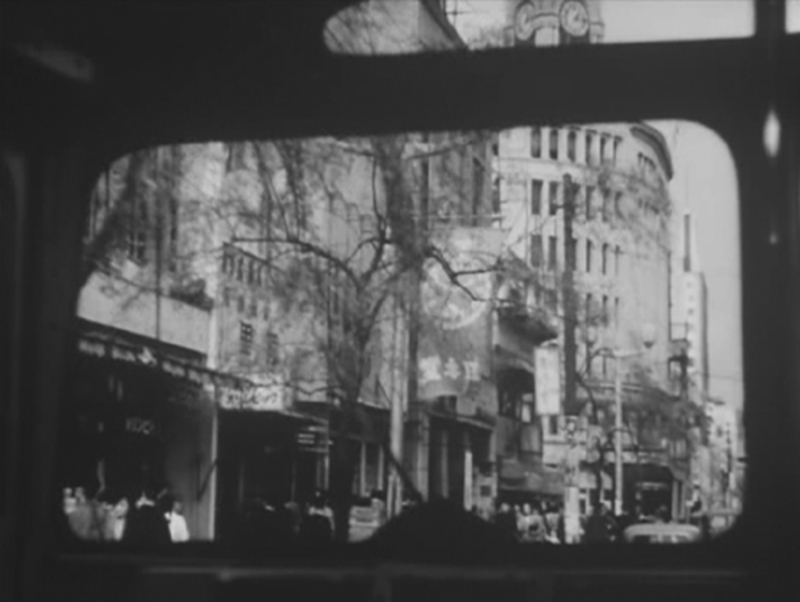 Apparently, Ozu was very careful about choosing the exterior shots in “Tokyo Story”. Chimneys. That was the Senju Power Plant (Tokyo Electric Power Company), famous for its “Monster Chimneys”. It survived the bombing during the war, somehow. The Senju Bridge. Tomi talks to her grandchild on the river bank about his future and hers. The bridge can be seen in their background. The Senju Bridge was built in 1927 and survived the bombing. Wako Building. You can see it at the end of Hato bus tour. This is one of few buildings in Ginza, which survived the bombing. Matsuya Building. From the exterior staircase of this building, Hirayamas and Noriko look over the panorama of Tokyo. This is the another building which survived the war. The building had been used as a PX until August 1952. After the renovation, it reopened as a department store on May 20, 1953, just a few months before the Tokyo Story shooting. It seems that many of the pivotal architectures in “Tokyo Story” are the ones which survived the bombings during the war. This is, as if Ozu was looking for a continuous narrative which had not been tampered by the destruction of the war. The year was 1952. On April 28 of that year, Treaty of San Fransisco was enacted. Japan had become a responsible independent nation again. Next is the last part of the series, concluding the discussion of Hirayamas and role of strangers in Tokyo.